Base Rate 0.05% (if requirements are not met). * 1.25% Annual Percentage Yield (APY) paid on balances between one penny and $5,000, and 0.049% APY paid on all amounts above $5,000 each cycle the minimum requirements are met. If you do not meet the requirements per cycle, your account will still function as a free checking account earning 0.05% APY; however, it will not receive ATM refunds for that time period. Rates as of September 11, 2017. We may change the interest rate and APY at any time after the account is opened. No Minimum Balance required. However, you must deposit a minimum of $100 to open this account. Available to Personal Accounts only. No monthly service charge. ** ATM fee refunds: We will reimburse you $4.99 per transaction up to $25 per monthly statement cycle if the requirement are met. ATM Fee reimbursements will be credited to your account on the last day of your statement cycle. If you believe that you have not been reimbursed the correct amount, please contact us. Debit Card Processing (Post/Settle): Please note that transactions must post to and settle your account during the monthly qualification cycle. The transactions may not be in a pending state (hold or memopost) to qualify as one of the transactions. Transactions may take one or more days to settle and qualify as one of the transactions. The time to post and settle varies from merchant to merchant. Debit card transactions processed by merchants and received by the bank as ATM transactions do not count towards qualifying debit card transactions. Only debit card transactions processed by merchants and received by the bank as POS or NON-PIN based transactions count towards qualifying debit card transactions. Monthly Qualification Statement Cycle: Statements are processed monthly. Statements end on the 11th calendar day of each month. "Monthly Qualification Cycle" means the period beginning one day prior the the first day of the current statement cycle through one day prior to the close of the current statement cycle. Your account will be automatically qualified on that one day prior to the first day of the current statement cycle. What this means for you is if you did not qualify for the "rewards" rate, you might notice a slightly higher than the base rate APY earned on your statement due to the one day (the last day) being calculated with the higher "rewards" rate. 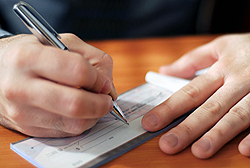 An overdraft on the account may occur via check, in person withdrawal or electronic means.